I realized that the error was being generated each time that my theme’s index.php file was called directly, and that the error was caused by the theme’s inability to locate the WordPress get_header function (which is completely normal). Thankfully, the descriptive error wasn’t being output to the browser, but was only being logged to the error_log file, due to the inclusion of the ini_set(‘display_errors’, 0); line. I had learned this the hard way a few months ago when I found that calling the theme’s index.php file directly would generate an error message, output to the browser, that would reveal my hosting account username as part of the absolute path to the file throwing the error. So there you have it. No more fatal errors due to get_header when loading the WordPress theme’s index.php file directly. And if something else in the file should throw an error, ini_set(‘display_errors’, 0); means it still won’t be sent to the browser. This entry was posted in Tutorials, Web Site Dev, WordPress and tagged 500 error, Apache, blogging, coding, php, programming, security, themes, troubleshooting, WordPress on 2 June 2011 by Oliver Baty. In August, 2010, I described a simple method for dramatically reducing the number of spam comments that are submitted to a WordPress blog. The spam comments are rejected before they are checked by Akismet, so they never make it into the database at all. 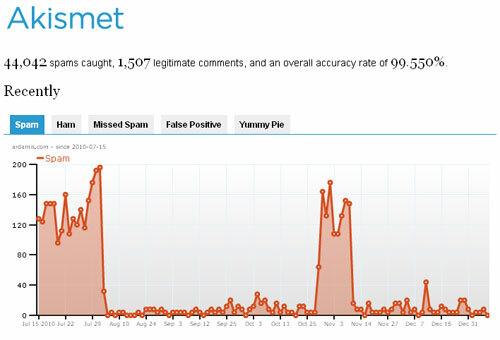 Now, a few months later, I’m posting a screenshot of the Akismet stats graph from the WordPress dashboard showing the number of spam comments identified by Akismet before and after the system was implemented. The spike in spam comments detected around November 3rd occurred after an update to WordPress overwrote my altered wp-comments.php file. I replaced the file and the spam dropped back down to single digits per day. This entry was posted in Web Site Dev and tagged 500 error, Apache, blogging, comment spam, database, mysql, spam, WordPress on 18 January 2011 by Oliver Baty.